We developed the box mount, also known as a standout, as an elegant and affordable method to display prints. This mounting works especially well with our fine art papers which cannot be used with gallery wrap. 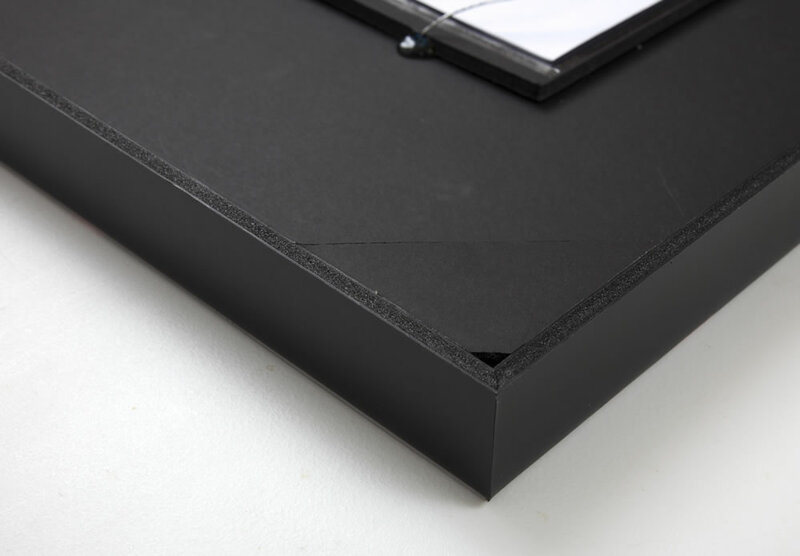 The coated black paper surface of the panel shows on the sides to frame the print. 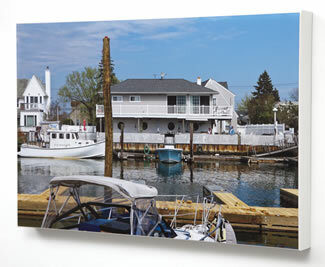 We can print on canvas, fine art paper, luster photo paper, and metallic photo paper. We can mount your print that you print yourself or obtain elsewhere and ship to us. 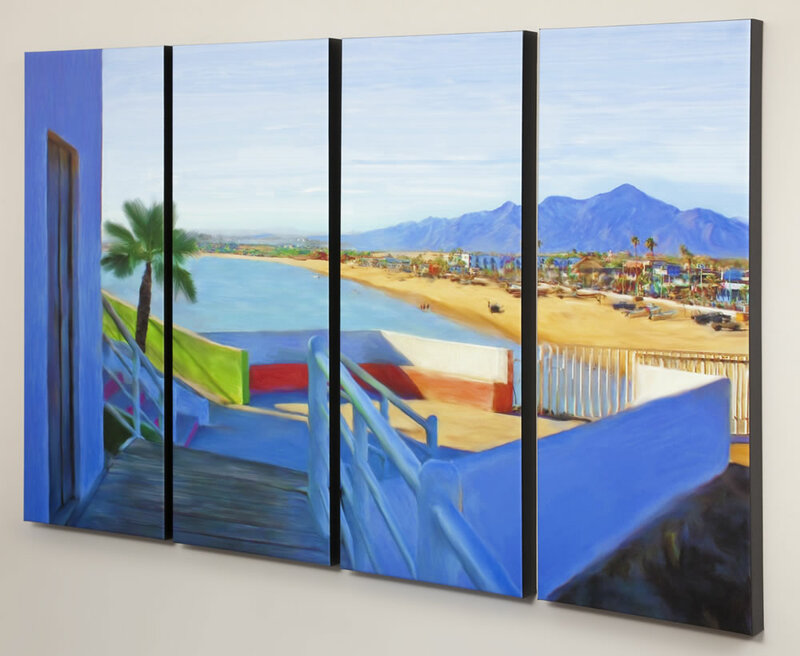 The print dimensions can range up to 32x44x2 inches. The depth of the box (distance it stands out from the wall) can be varied between 1 and 4 inches. Because it is hung from a wire loop on the back, the box is held tight against the wall. Sides can be black or white (we recommend black). 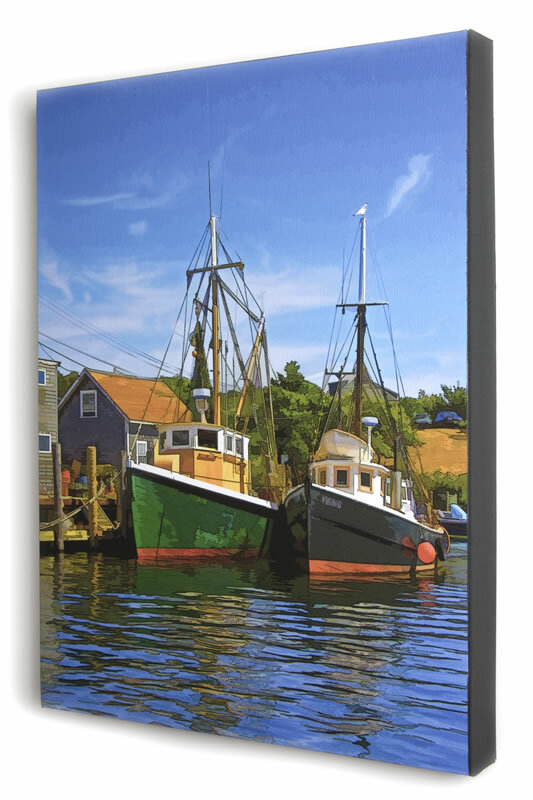 We can print a mat-look, dark or light vignette, or other types of borders. We can divide one image into several prints that, when hung together, look even better than one very large print. See below and learn more here. 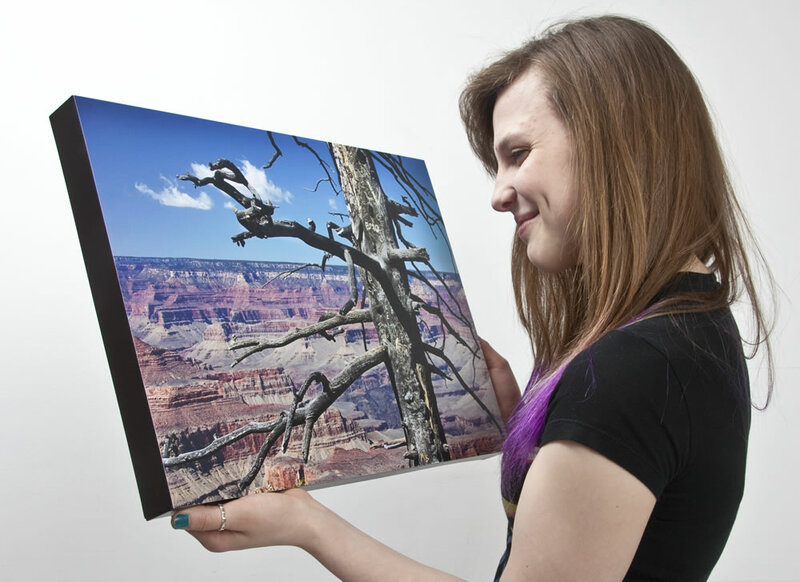 We can sell you a Box Mount Kit with a pressure sensitive adhesive on the front so you can mount your print yourself. 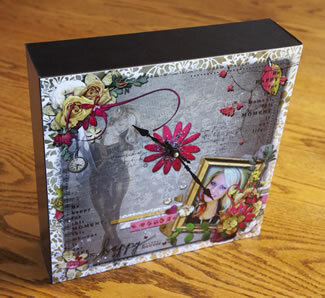 We can add a clock anywhere on the face of the print. Box mount is less expensive. Photo by Robin Waters. Click to see larger. Photo by Satya Banga. 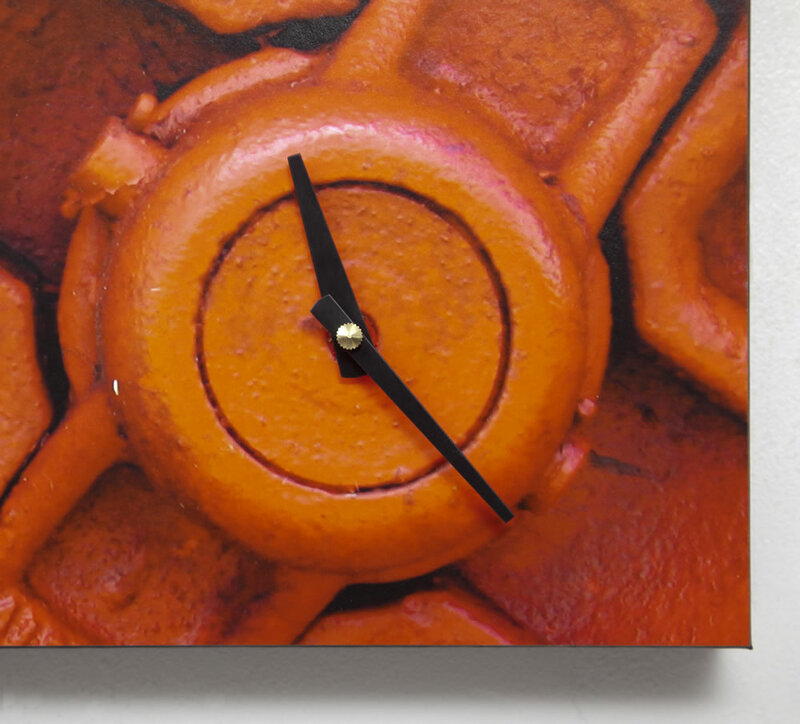 Click to see clock detail. Here you can see the handsome look of borderless with black sides. This has the same ready-to-hang appeal as Gallery wrap but you end up with a larger print since the paper is not used on the sides. This giclée image was copied from a large original drawing then printed on fine art paper. 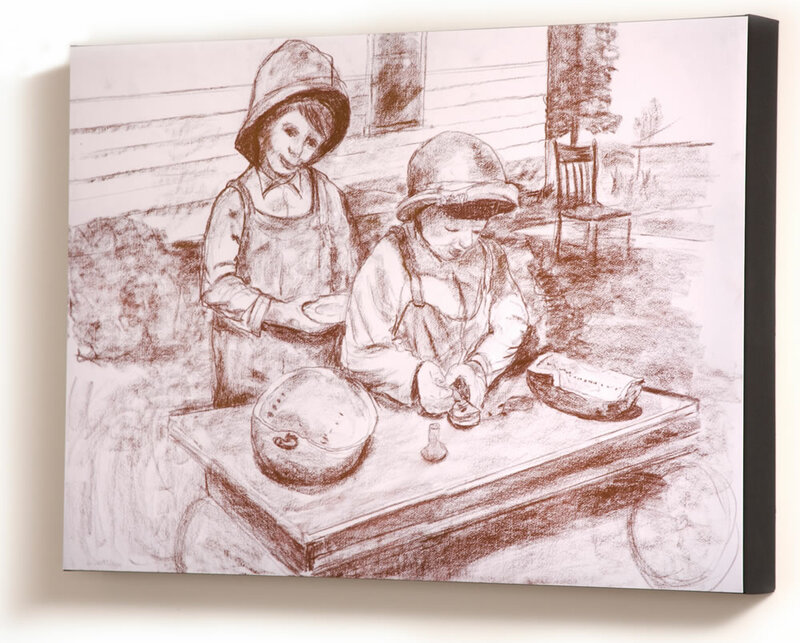 This digital artwork was printed on 13x17-inch canvas then mounted on the front of a 1.5-inch deep MightyCore box. For some images white works better than black for the sides. This 6x9-inch Box Mount print has extra weights in the bottom (no extra charge) and is 3 inches deep so it will stand up on a desk. This clock will sit on the table or hang on the wall. Artwork by Lori Charette. Click for detail view. 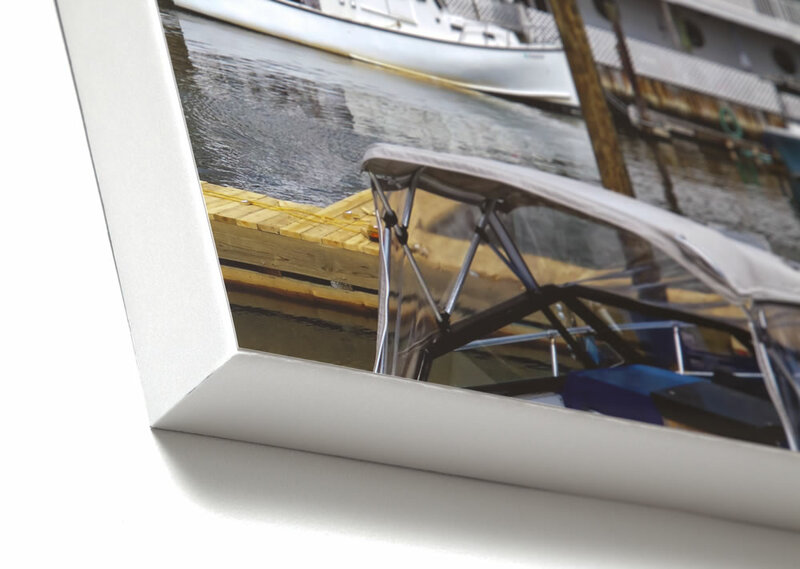 The Box mounting is constructed with strong acid-free 1/4-inch-thick MightyCore to keep the print flat. All prints are provided with hanging wire, hook, and nail. 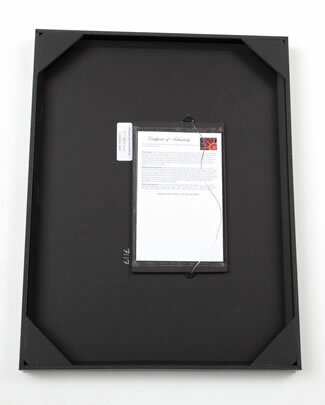 The free Certificate of Authenticity has hanging and care instructions, warranty, and information about print and image. Click to see large corner detail. Some creative Photoshop work makes this print stand out. Outstanding quality and customer service. 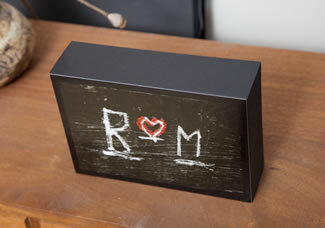 The staff was beyond helpful in perfecting my prints and I am thrilled with the results of my box mounted pictures. I have ordered through Redipix twice now and hope to continue doing so for years to come. Needed a job produced quickly for a commercial art installation and was VERY happy with the service, the finished product and the willingness to expedite the order. Submitted a family Christmas photo for my parents to display, and the box mount looks great and isn't too expensive. While I haven't even seen it yet, they told me it looks amazing and they get compliments on it all the time. I'm back to order a smaller version for my grandmothers wall. 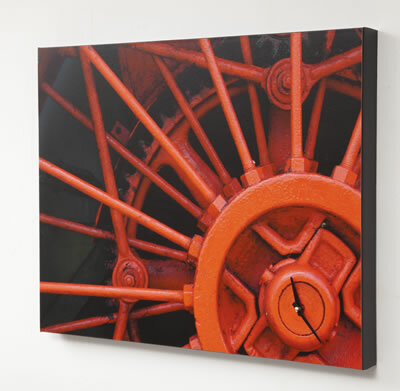 We are very happy with the speed and quality of our box mount pictures. I don't have the best photo software so they also did the cropping for me, which was very helpful. I also appreciated the suggestion to use glue dots to hold the picture in place. Such a simple solution! Would definitely recommend redipix to people and use again. ( you may Post my photo ) I have been very satisfied again and again with the quality and care that redipix has given to each one of my mounts. My clients are very happy and I feel that I can completely trust the staff at Redipix to make my work look its best.